“I’ve been waiting all weekend. Democrats must get to work now. Border must be secured!” the president tweeted. Washington is feeling the effects of the extended shutdown, which has closed or partially-closed scores of government agencies and national tourist destinations. The city is also digging out of a snowstorm that dumped 6-10 inches of snow over the weekend, closing the federal government and D.C. public schools Monday. “At this point it has become their, and the Democrats, fault!” Trump tweeted. According to a recent ABC News/Washington Post poll, a majority of Americans holds Donald Trump and congressional Republicans mainly responsible for the partial federal shutdown. Only 24 percent of those polled back Trump’s claim that there’s a crisis at the southern border and 66 percent oppose his declaring a national emergency to fund a wall there, according to the poll. Democrats have called for the president to end the shutdown by abandoning the wall, one of his foremost campaign promises, and instead listen to bipartisan ideas on border security like sensors, radar or drones with cameras. Pelosi has called a wall an “immorality,” arguing it won’t effectively secure the border. 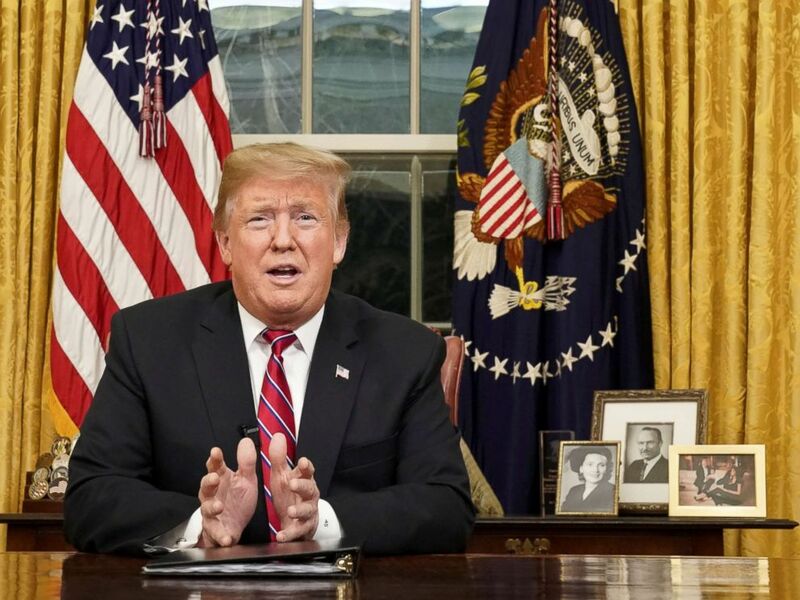 President Donald Trump deliversÂ a televised address to the nation from his desk in the Oval Office at the White House in Washington, Jan. 8, 2019. As the politics involved continue to deepen the lines in the sand, 800,000 federal workers are caught in the crossfire. Many missed their first paychecks since the shutdown started on Friday, according to the American Federation of Government Employees, and another one-third missed a paycheck Monday. About half, 420,000 federal workers, are still required to work despite receiving no pay. Republican Sen. Lindsey Graham of South Carolina, often Trump’s ally in the Senate, proposed that Trump briefly re-open the government in an interview on Sunday. But on Monday, as he was leaving the White House for a trip to New Orleans, Trump said he “rejected” Graham’s proposal. “I want to get it solved. I don’t want to just delay it,” Trump said. Others, including House Minority Whip Steve Scalise, argue that it’s time for Pelosi and Schumer to come to the table. Democrats continue to point to Trump’s initial willingness to accept the shutdown, which he said he was “proud” to own during an Oval Office meeting with Schumer and Pelosi in mid-December.